Carbide powders｜JAPAN NEW METALS CO., LTD.
Metallic carbide powders are representative hard materials that have been used in a wide range of applications. Cemented carbide that consists primarily of tungsten carbide, has a history of over 70 years, is used for cemented carbide tools and wear-resistant tools, additionally its improvement of properties has brought an expansion of demand continuously in diverse applications. 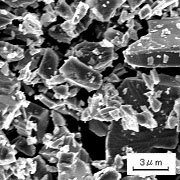 Japan New Metals can produce several types of carbide powders other than Tungsten carbide powder , which are mainly used for the improvement of alloy characteristics. TiC, TaC (generally WC-MC solid solution), VC, Cr3C2, etc. 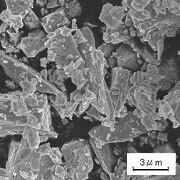 are added to cemented carbides as accessory ingredient to improve their characteristics. TiC is the main ingredient of cermet cutting tools, and in addition TiN (TiC-TiN solid solutions), NbC, VC, WC, Mo2C, etc. are also added. 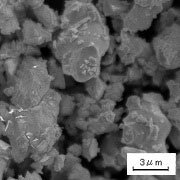 TiC is also used as an additive to add electrical conductivity to an alumina-based ceramics. WC and NbC are used as hardfacing materials such as in thermal spraying, etc. ZrC possesses outstanding infrared radiating characteristics so it is employed in heat insulating materials, etc. （*3）HfC is a restricted item by Japan's export control regulation.